Christian Walton: 7 - Brave decision from Paul Cook to stick with him after costly errors at Hull in midweek, but more than repaid his manager with faultless display. Nathan Byrne: 7 - Not able to get forward as much as he'd have liked but defensively sound, and well protected down the right by Massey. Chey Dunkley: 7 - Stood up strong against one of the best attacks in the division, looked far more comfortable than in recent weeks, great to see. Danny Fox: 8 - Very reassuring presence since his January arrival, but once again forced off by injury and fingers crossed it's not serious. 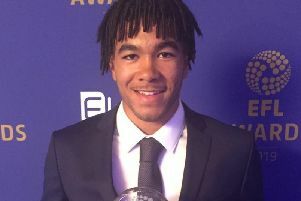 Reece James: 9 - Another imperious display, capped by nerves of steel from the penalty spot just before the break. Never a chance he wasn't scoring. Gavin Massey: 7 - Great shift at both ends before his substitution, might have made more of an early shooting chance. Lee Evans: 8 - Major surprise to see him handed the 'Powell' role behind the frontman, but put himself about well and staked a claim for more regular inclusion. Kal Naismith: 8 - Another whose selection raised eyebrows pre-match, but also rose to the occasion, and one run in the second run almost laid on a goal for Clarke. Leon Clarke: 8 - Given the nod over Garner and best game for Latics, unlucky to see 'goal' ruled out for offside as well as seeing another effort tipped inches wide. Josh Windass (for Massey, 72): Squeezed out of the side and not long to impress. Nick Powell (for Naismith, 72): Given all-clear after hamstring scare and decent run-out. Jonas Olsson (for Fox, 89): Old head perfect for stoppage-time cameo. Subs not used: Owen Evans, Cedric Kipre, Darron Gibson, Joe Garner. Norwich (4-2-3-1): Krul; Aarons, Zimmermann, Godfrey, Lewis; Trybull, McLean; Cantwell, Stiepermann, Hernandez; Pukki. Subs: McGovern, Vrancic (for Lewis, 76), Leitner (for Trybull, 76), Rhodes (for Cantwell, 76), Klose, Hanley, Srbeny.